The most powerful tool in neurology is the history and physical exam, including the requirement that patients walk in the presence of neurologists, in order to better understand symptoms. Insulin types and doses newly approved by the FDA present new opportunities and challenges for glycemic control. New guidelines recommend basing treatment decisions on levels of risk rather than LDL targets. Nonalcoholic fatty liver disease (NAFLD), which accounts for 30% to 40% of chronic liver disease in the U.S. today, is the hepatic manifestation of the metabolic syndrome and is associated with sleep apnea, cardiovascular disease, and diabetes. Every asthma or allergy patient has a story, and the details that the patients relate tell the internist how best to manage and treat several conditions that are interrelated and frequently comorbid. Weight loss and nutritional counseling should be the first step, while opioids are always and only a last resort. It might require a little detective work before offering a cure to patients with common outpatient infections such as sinusitis and community-acquired pneumonia (CAP). Some patients need more than just routine screening for sexually transmitted infections (STIs). Accurate diagnosis and timely treatment can improve quality of life while preventing re-infection. The key to being a good volunteer is to be placed at an appropriate site and find a volunteering experience that suits your needs. 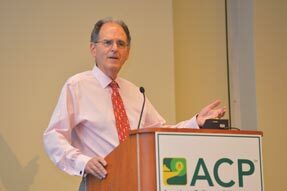 ACP is once again proactively addressing an issue of importance to human health: climate change. There is a growing awareness among physicians that the Medicare Access and CHIP Reauthorization Act (MACRA) makes important changes in how Medicare will reimburse them, as well as confusion about what will be different and what they should do to be ready. This issue covers topics such as the proper way to do a neurological workup, recently approved forms of insulin, and how to address nonalcoholic fatty liver disease. Physicians want to know how to tell if their practices might qualify as an Advanced Alternate Payment Model, which will garner extra reimbursement for quality patient care, and whether they might meet the standards of a qualified professional under the Medicare Access and CHIP Reauthorization Act. This update covers a warning that aripiprazole may be associated with compulsive or uncontrollable urges, as well as approval of the first generic version of rosuvastatin tablets. ACP conducted a special nomination process and election to fill the vacancy left in the President-elect position by Darilyn V. Moyer, MD, FACP, who will become ACP's Executive Vice President and CEO in September 2016. The Board of Regents and Board of Governors elected Jack Ende, MD, MACP, as the 2016-2017 President-elect. Readers respond about managing depression and obtaining prior authorization. A 28-year-old man is evaluated for a 3-week history of “stuffiness,” decreased hearing, and discomfort in his left ear. He has no other symptoms and otherwise feels well except for mild nasal congestion that he attributes to seasonal allergies. Medical history is unremarkable, and he takes no medications. Following a physical exam and exam of the left ear, what is the most appropriate next step in management?.